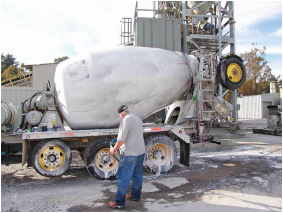 BIO SLIME Concrete & Rust Remover is a breakthrough in the removal of unwanted concrete residues and rust. It will not harm materials such as iron, steel, decals, paint, plastic, rubber or vinyl. Ideal for cleaning forms, pavers, portable mixers, swimming pools, tools, windows, anywhere you find cement, gunite and mortar. NOTE: 1. DO NOT use on guns, polished or anodized aluminum, magnesium, or galvanized or decorative metal surfaces. 2. Pretest in an inconspicuous area prior to using on painted surfaces. 3. DO NOT allow product to remain on surfaces any longer than is necessary to remove the concrete and rust. 4. Use only acid resistant spray systems. When spraying, apply using a coarse spay; do not mist. 5. Do not transfer or store in metal containers. Clean surfaces completely to remove soils, oils, and grease. May be applied to cleaned surfaces full strength or diluted with up to three parts of water for spraying large areas. While concrete removal begins instantly; removal can be accelerated by brushing the treated surface with an acid- resistant soft bristle brush. Dilute one part of product with up to three parts of water. Remove any grease and oil first, then submerge metal in a poly, plastic or rubber dip tank. Steel tanks may also be used if they are coated with epoxy paint. Once clean and free of deposits, neutralize surfaces completely with GOLDEN WEST SOLVE and then rinse thoroughly with water. Unprotected iron and steel surfaces must be protected by painting or coating with a rust preventative to prevent re-rusting.